Marc Chagall is one of the greatest visual artists of the twentieth century. He did not shy away from counting himself among the greatest Western artists of all time. His use of colour is brilliant and tied in closely with the meaning we assign -often unsconsciously- to the many colours and colour combinations that exist. He also sought to distill his imagery from the common background, often subconscious, shared by Western people. This gives the images and colours a broad appeal: Chagall‘s work is not restricted to a select group of art lovers and connoisseurs. Only too aware of his stature, Chagall worked systematically from 1914 on, when he returned from Paris to his native Belarus, to enhance the myths surrounding his person. He rewrote his youth and led a colorful, nomadic lifestyle -certainly in the first two phases of his life, up to age 65- which facilitated the myth-forming. This was all the more possible because many of those in his circle helped perpetuate the myths. Chagall preferred seeing himself as a self-taught artist who only esteemed a handful of artists beside his great example Rembrandt. He downplayed the influence and things learned from the teachers of his youth. And it must be said that during his student years in Paris (1911-14) he continually started anew and from scratch. He was determined to invent the wheel himself, and not only in painting: later, he would also find his own way, largely unaided, in his graphic and glass art. Chagall grew up in a pious Jewish Orthodox environment at the end of the nineteenth century, when the religious experience in Europe was receiving strong new impulses. Upon leaving the parental home, he discarded most of this as antiquated ballast. He did however feel a strong connection to the Jewish people all his life. It irked him when his art was classified as ‘Jewish-art’, even if much of his imagery has Judaeo-Christian connotations and about a third of his work has religious undertones. He himself traced his art’s religious character to the deeper, unconsciouly active layers in European culture. 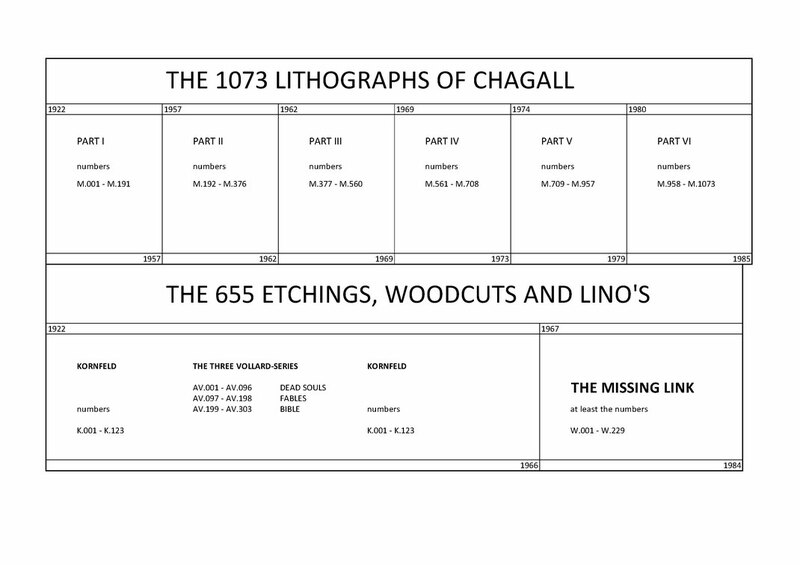 In six parts of the "Chagall Lithographs", all his lithographs are ordered by date. Starting from 1922/23 (with Mourlot nr 1) until March 1985 (with Mourlot No. 1073). It has committed itself to the more stricter standards of Chagall. Kornfelds catalog of Chagalls first etchings, woodcuts and lino's appeared in 1970. It included all these works by Chagall (k. 001 up to and including k. 123) untill 1966, with the exception of the three etching series, which were manufactured by order of Vollard. Kornfelds plan to dedicate a separate edition to these works, got a different shape with the publication in 1970 of this etching series under the nrs. AV. 001 up to and including AV. 303. 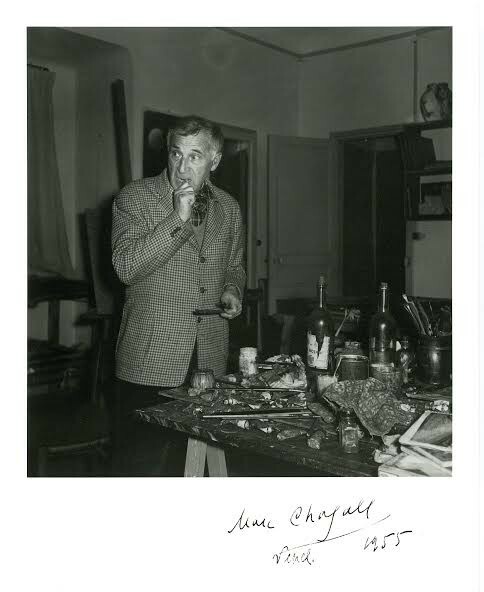 Chagall entrusted Kornfeld with the publication of all his work that appeared after 1967. Now you can find these 229 works in ’THE MISSING LINK’-catalogue. Het hart van het Research Centre ligt in de bestudering van Chagalls leven en zijn grafiek. In dertig jaar tijd heeft dit geleid tot bijna vijfhonderd lezingen voordrachten, inleidingen en workshops door heel Nederland en een enkele keer buiten deze landsgrenzen. Vijftig keer verscheen er een publicatie, die hier op jaartal terug te vinden is. Voor nadere informatie kunt u zich wenden tot info@chagall.nl. We zijn van plan om regelmatig (het raamwerk van) zo’n publicatie op de website te plaatsen. Lees hier de nieuwste PAPER OF THE MONTH.